HALLIE EPHRON: There's a movie moment when Andie MacDowell sings a sweet little song that declares, "Me oh my, I love pie." And in these dog days of summer, I do love pie. Blueberry pie. Key lime pie. Peach pie. But pie is a food for all seasons. In the cool crisp fall, apple pie. Winter calls for the warm creaminess of pumpkin pie and the savory snap of a good quiche. I remember the coconut cream pie (which I managed to duplicate once, right down to the toasted coconut sprinkled on top) that you could get at Hamburger Hamlet in LA (back in the days when they made their own incredible lobster bisque which still sets the standard for me). I had its rival a few years ago at Jestin's Kitchen in Charleston. 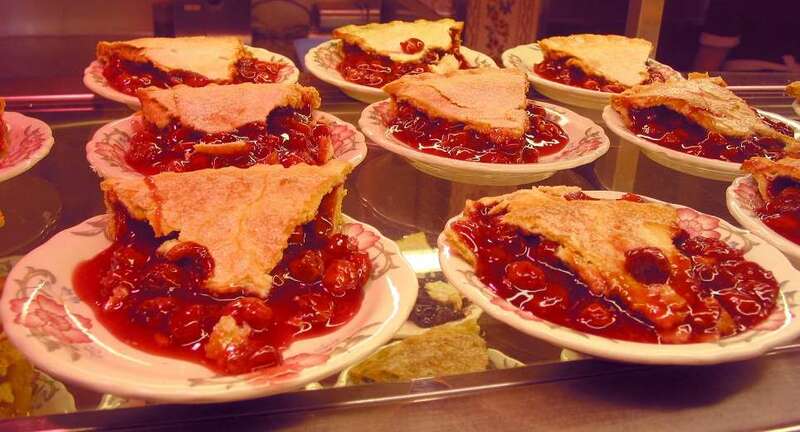 I confess a weakness for the kind of cherry pie you can get at cafeteria-style restaurants just about anywhere there are restaurants like that. The bottom crust usually turns into something that resembles wallpaper paste, but no matter because I just eat the filling. I can still eat cherry pie filling straight out of the can. I've never found a recipe to duplicate the deep dish peach cobbler we used to have when I was growing up. Buttery, sweet and tart, with a flaky crust on top. And besides, skinning peaches is a royal pain. 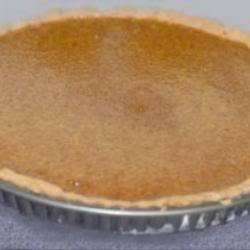 But the wonderful creamy cheese pie--a bottom layer of sweetened cream cheese and egg, a top layer of sweetened vanilla-flavored sour cream, baked in a graham cracker crust (you gotta use crumbs, not the kind that comes premade) is in the Joy of Cooking. You can blow an entire day's calorie allotment with a single slender slice. Weirdest pie I ever had was shoo-fly pie. Basically molasses and eggs baked into sludge. Someone must like it, but it's gotta be an acquired taste like Vegemite. And I confess, ice cream pies never did me much. RHYS BOWEN: When I was at school they served us something called gypsy tart. It was essentially baked condensed milk over pastry. Of course as kids we loved it,but I've never seen it anywhere else. The best pies I've ever had? My mom's. Every Sunday morning she baked an apple and a lemon meringue pie and we devoured both for Sunday lunch. Even then I used to think it was an awful lot of effort for ten minutes of eating. But I've inherited my mom's good pastry making skills. HALLIE: Rhys, I found a photo of a gypsy tart, and the recipe IS just a special raw cane sugar and condensed milk. It sure looks like a cousin to shoo-fly pie. JAN BROGAN: When I was a kid my mother took a powder on cooking and stocked the freezer with frozen chicken pot pies. I developed such a fondness for them that my first mission as cook in my early twenties was to try to make one from scratch that tasted almost as good as the cheap frozen version. So, armed with my aunt's fool-proof pie crust recipe (the one with vinegar and crisco) I made my first chicken pot pie -- And because i had NO IDEA what I was doing, I started by boiling an entire chicken on the stove and making a sort of stew. To season it, I simply went with the Simon and Garfunkel lyrics "Parsley Sage Rosemary and Thyme" And except for a few bones I failed to extract, it was actually quite good. And my home-made chicken pot pie became a great success!! HALLIE: That sounds absolutely delicious! I've never even attempted a chicken pot pie. Too many steps! DEBORAH CROMBIE: My mother made great pies when I was growing up, and her specialty was lemon meringue. I've never even attempted to duplicate it. Nor did I inherit her skill. I got the whole foods bug about the time I really started learning to cook, so made things like whole wheat pancakes and whole wheat scones (both yummy, by the way) and lovely quick breads and gingerbread. I can't make a cake to save my life. Like Jan, I have a thing for chicken pot pies. 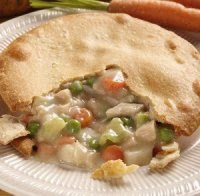 My grandmother lived with us when I was growing up and every time my parents went out of town, my gran and I had chicken pot pies in front of the TV. Swanson's chicken pot pies are still my ultimate comfort food, although I now know the ingredients are disgusting. ROSEMARY HARRIS: Hallie, have you seen the movie Waitress? Good, indie film about a girl who makes pies and some of the visuals are wonderful. HALLIE: I loved that movie! Just added it to my Netflix queue to see it again. ROSEMARY: When I was little I thought pies came in cardboard boxes. We lived near a bakery that supplied supermarkets and diners and we always had stacks of individual pies and massive restaurant-sized pies. I hated them. Totally tasteless. My mother never made fruit pies but around Easter time she would make these incredible wheat pies - or as my grandmother called them grana cakes. They were works of art with woven lattice strips on top. I've never found her recipe but I'd love to try my hand at one some day. Do you all know the delightful Amy Alessio? She's a librarian, mystery writer and foodie who has a blog called vintage cookbooks. I bet she has a recipe for it. The one pie I make over and over again is a savory onion pie. I was working at WNET and there was a show called Cooking From Quilt Country about Amish cooking when I got the cookbook. I can make that pie blindfolded. 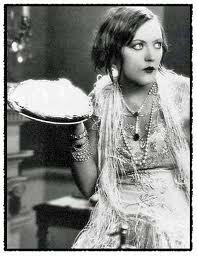 HANK PHILLIPPI RYAN: Pie. I think...I'm not a fan of pie. Weird, huh? 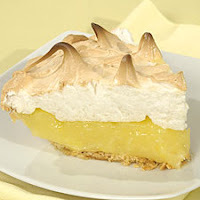 My mother used to make wonderful lemon meringue pie, I remember, it was SUCH a treat. I can still taste that tangy lemon and remember how the sticky meringue stuck on my fork. And frozen chicken pot pie, Jan, yes, all that nice (now yucky) cornstarchy gravy stuff. And peas. But I never liked the crust. Boston cream pie? no. Quiche? No. Fruit pies? Ah, take it or leave it. One bite, maybe, of peach and blueberry. But after that? Diminishing returns. Pizza! Yes. But is that pie? JULIA SPENCER-FLEMING: Oh, Hank. I've heard there are people who didn't like pie, but I've never met one before! In our family, Ross is the piemaker (isn't that wonderful? And I didn't even know he could do it before we got married. )My mother and her mother made the best pies in the world, but I seem to have missed the pastry gene. Like Ro, I also have a soft spot for savory pies, which led to my greatest pie disaster. One Thanksgiving, I decided to make an authentic 17th century beet pie. (Hint: don't try to make an authentic 17th century anything. If it was really good, we'd still be eating it today.) I peeled and cooked and made a "savoury wheat crust," and when it was done, I offered my guests the original Pilgrim experience. Well, either I got the recipe wrong or the Pilgrims ate as a kind of mortification of the flesh, because it was almost inedible. The crust was like heavy-duty cardboard and the beets were crunchy and vinegary. My poor father-in-law ate a whole large helping just to make me feel better. The next year, we stuck to Ross-made pumpkin pie. Over the years I've decided I like pie way better than cake, and fruit pie in particular. A few years ago there was a pie-making contest at the farmers' market, with the stipulation that the main ingredient had to come from one of the market vendors. I decided to make a pear tart using Calvados, and a bitter chocolate pecan crust, my own recipe. The only problem was that I couldn't taste it, since it had to be judged! It got second place. Everyone else made an apple pie, and one of the judging criteria was "crust appearance". Mine tasted a whole lot better than it looked, since the pears were spiraled on top, a la tarte tatin, and the deep brown crust looked burnt. But, oh, was it tasty. My husband would do double backflips for homemade cherry pie or blackberry pie. I love pies. Hallie, I make a version of that cheesecake with a recipe called "Gary Cooper's Housekeeper's Cheesecake" which I got from a former boyfriend (who made PERFECT piecrust) who got it from Judy Norsegian. (How's that for namedropping?) I once counted the calories at about 1000/slice. Worst pies? I use whole wheat flour for all my bread, muffins, pancakes. But never more for pie crust! Might as well eat hardened sawdust. Pear with chocolate and pecans! WOW! Echoes of Poire Belle Helene. I've made several pear tarts, always good but this one sounds off the charts, karen. Did you save the recipe by any chance?? Laughing, Edith... "healthy pie crust" does sound like an oxymoron. I have a recipe for a pear gorgonzola tart ...somewhere...must find. My all-time favorite pie is blueberry so long as it is made with the tiny, wild berries that grow in eastern Maine. We have had some mind-blowing blueberry pies from such places. Heading down there next week. Can't wait. BTW: Not to brag, but several Junes ago I took home a blue ribbon at the Peaksfest pie baking contest on Peaks Island. My winning entry was a strawberry pie. The top crust was decorated with cutout moons because the June moon is the Strawberry Moon. I still treasure the ribbon. I loved that movie, Waitress!! Congrats on the second place prize, Karen, I'm going to be thinking all day about that pear tart with a bitter chocolate pecan crust. Brenda, you should brag!! That strawberry pie sounds awesome. My mother made a rotating quartet of pies: the ubiquitous lemon meringue, lemon chiffon, chocolate cream and chocolate chiffon. I'd lay odds that they're all from the Fanny Farmer Boston Cooking School cookbook. When my husband and I lived in northern California, we had a lemon tree just outside the kitchen, so we perfected our lemon meringue version. My grandmother--who did not cook but who did work for Lipton Tea, which was part of Unilever, which I believe made Ritz Crackers--once argued passionately that the Mock Apple Pie recipe that use to grace the Ritz Crackers carton tasted just like the real thing. I've never tried it (and don't plan to!). But I'm still hunting for a pie crust recipe that works for me--I'm definitely pie-crust challenged. Not a huge pie fan. Save my splurges for things like Napoleons. But there are those cream pies. I'll eat just about anything sweet if it floating in a high fat dairy product. Can't help it. Half Dutch, half Danish. It's my soul food. Pie crust... I can make my own, but almost as good is Betty Crocker crust in the refrigerator section of the supermarket (it's already made, you just unroll it and lay it in the pan). A trick is to bake the bottom crust for 3 minutes before you fill it -- then it doesn't get gooey. But graham cracker crust's gotta be made that from BUTTER and crumbs--packaged crusts taste lie cardboard. Or worse. And I've always wondered--why do they say "easy as pie"? Since some..aren't so easy? Maybe they should say--"easy as bad pie." Truer, but without the rhythm. When my daughter was six, she leaned about pumpkin pie in school and was utterly fascinated that one could make a pie out of a pumpkin. She was thrilled when we told her we would be having pumpkin pie at Thanksgiving. On the big day, my daughter ate all of her dinner and armed with a fork dove into the pumpkin pie. Oh her face! I wish I took a picture. She hated it, but tried to be so polite. My other daughter, who was two at the time, was less complimentary. She pulled the blob of pumpkin pie out of her mouth, placed it on her plate, and said, "Yuck! I don't like this." Neither one has touched pumpkin pie since. I love pie, too, Hallie, and I can't believe no one has mentioned pecan pie! That's my all-time Thanksgiving favorite. Hey Carolyn! Checked out your post on "butter tarts" - they sound fabulous. Next time I'm up that way, it'll be o my list of things to look for. My husband LOVES pecan pie. Me not so much. Too sticky sweet. Oh, Melissa, how sad! I love love love a good pumpkin pie. And one year we actually made one from the day before's massive Halloween pumpkin. SKINNING a pumpkin is not for the faint of heart. Took me awhile to realize I should cook it first. Thanks, HulaMonkey - have signed up to get that book. My mother made good pies, and I always make her pumpkin pie (sort of a pumpkin custard) and apple pie (the secret is Jonathan apples) in the fall. My specialty is Arizona Sunshine Pie, a lemon pie. I make my own crusts using canola oil so they're semi-healthy. I have learned that here in Arizona even the flour is drier so I have to add about a tablespoon more water to the flour/oil mixture to be able to roll it. I added Waitress to my Netflix queue, too! My daughter and I make Martha Stewart's chicken pot pie as a Christmas Eve dish. It is so yummy and rich. (and my Kapcha word is "ovene" which everyone knows is a very superior oven of the kind Martha uses to bake her pies. I moved to Houston from central Pennsylvania about 20 years ago, and the only rhubarb pie I've found here is a strawberry-rhubarb at House of Pies...and that just doesn't cut it! Pears and chocolate? Oh, my! I love French type tarts. Those I would be tempted to make. And for those who think "healthy pie" is an oxymoron, I used to have a whole wheat pie crust recipe that was good. You made it in the food processor--whole wheat pastry flour, cold water, cold butter, whizzed until it just forms a ball. Delish. Nancy, you'll have to make your own. I think rhubarb/strawberry pies made up here are WAY too sweet. I love pie. We have a pie night every year the night before Thanksgiving at my parents house. Everyone brings a pie or two, and it's all kinds of wonderful. I make an easy retro peanut butter pie, with peanut butter cups on top. My Mom makes wonderful pies of all kinds, but my favorite is her apple pie. My daughter who is nine makes an Oreo pie from Sandra Lee's kids cookbook. I also have a secret love of Swanson pot pies, and it must be a comfort thing because it takes me back to a time when every bit didn't have to be analyzed. I could talk about pie forever. The recipe is pretty long and involved. It was a bear to make! Another delish pie, a family favorite, is chocolate bourbon pecan pie. Why have plain old pecan pie when you can add bourbon and chocolate chips to it, I say! You taunting temptresses you! Unfair to treat your readers in such a way! My mouth is watering and dripping onto this keyboard...now I"m famished and want pie! And I remember that Lobster Bisque from Hamburger Hamlet, I was also in love with their french onion soup. The best in LA. Well, drop by the prairie to say howdy when you can pull yourselves away from the stove, or fork, or spoon and can! Yum! Cheery pie filling! Naughty! Pecan. That's all. Lemon meringue is the worst. It stings and sticks. Cherry pie brings on tears. That pear with bitter chocolate pecan crust, does sound tempting, tho, Karen, if it's not too tart. One Thanksgiving when the kids were small I made the usual two pumpkin pies. I doubled everything in the recipe but the evaporated milk so the pies came out more vegetable than custardy. Well, everyone loved the pies so from then on that’s how the Marinellis make pumpkin pie. Now my youngest son makes them, plus apple and coconut custard (his wife’s favorite). I Love PIE. My Gram always made the pies until I was old enough to make them; I got to help until then. And my Dad always made darknsweet chocolate pie My all time Favorite. He'd make fresh whipped cream to go on top. And if My Uncle Frankie knew we were coming over - he'd make me a DNS Choc pie. after homemade choc pie, I like Pumpkin, Gram's Strawberry glaze pie (homemade glaze (anyone wants recipe for the Stw glz pie, I am happy to share) , not the jarred stuff) such a short season for making the Stwbry glaze pie - have to use fresh berries; raspberry, Cheesecake ( I make a killer cheesecake)apple, cherry, Lemon Mer, blueberry (only if there is vanilla icecream with it) I like peach, but peaches are such a pain to work with, it is not something I make often - only made one this summer, quiche, chicken pot pie - Do not like Shoofly pie - had it once as a kid when we were in PA, ate at an Amish restaurant; I didn't order it - Daddy did and one taste of his, I was happy I had not ordered it! Bad pie! That's another post. If it's so easy to make wonderful pie, and it is, then how come most of the pies that come in boxes are lousy. Ditto cakes for that matter. Let's here it for homemade with real ingredients! The best pie: anything my Kansas grandmother made, without a recipe of course, her plump, deft fingers barely touching the flaky crust. Worst pie ever: also in Kansas at a truck stop in Newton: canned peaches, LOTS of cornstarch, and leaden crust. Personally I like any fruit pie, as well as pumpkin, pecan, chocolate, custard and well, any pie. Nothing beats pie for breakfast with maybe some cold fried chicken. Heaven. Oh, Judy - THAT is my all time favorite breakfast. Mmmm. A cold fried chicken leg with a sliver of warm apple pie. What a fabulous post! I now want to bake pie!